On October 2nd, more than 200 talent acquisition, HR, and D&I leaders gathered in New York City for Indeed Explore. The theme of the event was the “Search for Greatness.” This is particularly relevant as many companies are starting to remove tangible barriers to great careers and career growth — such as the college degree requirement which Indeed themselves recently removed. Leading companies know they will only be successful in finding great talent they need to compete if they remove intangible barriers, like the idea of “cultural fit”, and instead focus on skill. Companies eager to create a culture of equity and inclusiveness, in which all candidates and employees have a equal chance to succeed based on their skills and performance, often turn to D&I programs. 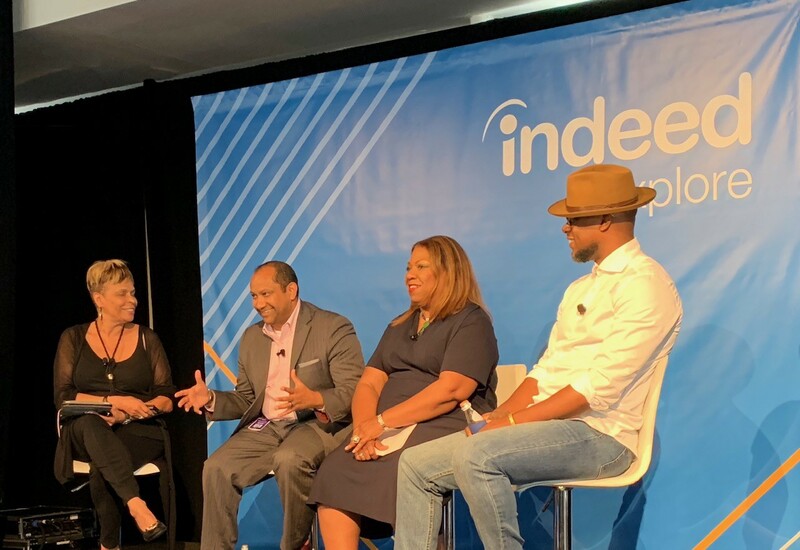 To help leaders along their journey, Indeed invited our D&I Leader, Portia Kibble Smith, Sal Mendoza VP of D&I at NBC Universal, and Jason Rosario Head of D&I at Oath to share what they’ve learned about creating company cultures that embrace diversity and how to succeed in being inclusive. Read on for the key discussion topics and learnings from the session. What should diverse candidates look for in a company? Look for evidence of an inclusive culture. Candidates want to know that their voices will be heard and they will be given the same opportunities as others in similar roles. Experiences, not programs. Candidates can see through a “program” that is designed to make them feel a certain way. They must experience the culture of the company on their own. This will go a long way to earning their trust. How can recruiters be more transparent about the inclusion climate in the business? “Oftentimes children of color are not encouraged to move out of their environment. So they are hesitant to apply for jobs that are lucrative but require them to move. Where are our panelists’ companies succeeding in D&I? Empower allies to be ambassadors. At NBC Universal, Sal is including allies in important and difficult conversations. This also means including them in interviews, but not using them as substitutes for diverse employees. Ensure that diversity and inclusion is a focus at all levels of the company. At Karat, we practice what we preach. Those interviewing to be a software engineer or interview engineer at Karat will go through the same consistent and structured technical interview that identifies skills, is predictive of on the job performance, and seeks opportunities to identify empathy. What can be done to mitigate unconscious bias in the recruiting process? Jason recommends taking a long hard look at your job descriptions. Avoid words that are clearly masculine or are “buzzwords.” Not all candidates will internalize these words the same way or understand them. Portia recommends being confident that your interview process is consistent and capable of evaluating skills needed on the job. Take measures to prevent biasing the process for things that are irrelevant and instead hire for competency. Above all, make candidates comfortable — a little humanity can go a long way. Prepare to go beyond diversity in race and gender. Talent leaders should start talking about neurodiversity. In a few short years, 35% of the workforce will be neurodiverse — this means having Autism, ADHD, dyslexia, or a similar disorder. Harvard Business Review has argued that this will be a competitive advantage for companies that embrace it. The world’s leader in technical interviewing.